Cut a straw into four pieces. Use a Hot Melt Glue Gun to attach the four straw pieces to a Chassis Base where you want the wheels to go. Sharpen all ends of two half Dowel Rods to a point. Thread a Dowel Rod through the straws and attach a Cardboard Wheel to each end. Secure the wheels with a blob of glue. Place an elastic band under the back axle and loop it around the axle and through the band to attach the band to the axle. Join another elastic band to this one and pull the two bands tight under the front axle before attaching the second band to the front of the base with glue and tape. 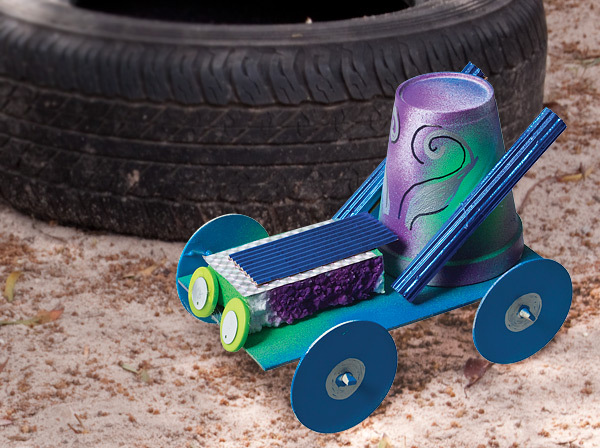 Construct and decorate the vehicle on top using an assortment of materials. Wind up the back wheels then hold them tight. Place car on a flat surface and release allowing the car to move forward.